I would like to book a test drive for vehicle Audi A8 TDI QUATTRO SE EXECUTIVE + MASSIVE SPEC!! I would like to enquire about the vehicle Audi A8 TDI QUATTRO SE EXECUTIVE + MASSIVE SPEC!! 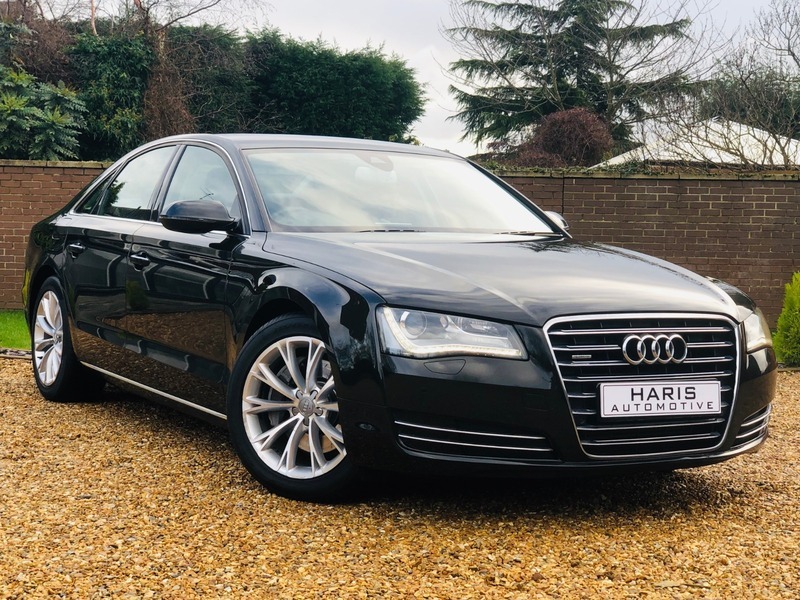 HERE AT HARIS AUTOMOTIVE WE ARE PLEASED TO OFFER THIS STUNNING PRESTIGIOUS SALOON + AUDI A8 3.0 TDI (250 bhp) + AUTO-TIP-PADDLESHIFT + QUATTRO- 4 WHEEL DRIVE + VERY HIGH SPECIFICATION 'SE EXECUTIVE' MODEL + 10 SERVICE STAMPS (9 AUDI MAIN DEALER & 1 INDEPENDENT) + LOOKS AMAZING, TRULY STUNNING CONDITION INSIDE and OUT and DRIVES ABSOLUTELY SUPERB + EYE CATCHING HAVANNA BLACK METALLIC with CONTRASTING FULL BLACK HEATED ELECTRIC MEMORY LEATHER UPHOLSTERY, COMPLIMENTED with a FINE BRUSHED ALUMINIUM and WALNUT WOOD INTERIOR TRIM + ADVANCED KEY + KEYLESS ENTRY-LOCK and KEYLESS PUSH BUTTON ENGINE START-STOP + REVERSE CAMERA + 19" ALLOYS + CHROME EXTERIOR TRIM + AUDI DRIVE SELECT + BI-XENONS MATRIX L.E.D. HEADLIGHTS + HIGH BEAM ASSIST + ELECTRIC/ HEATED/ MEMORY- EXTENDABLE FRONT COMFORT-SPORT SEATS with E/LUMBAR SUPPORT + REAR PRIVACY GLASS + AMBIENT LIGHTING + PARK ASSIST with ACOUSTIC and ON SCREEN WARNINGS + CRUISE CONTROL + DELUXE CLIMATE CONTROL + Mobile telephone preparation - High with Bluetooth privacy headset located in front centre armrest + DAB RADIO-CD MULTICHANGER + AUDI MMI - SD-SIM CARD READERS + NAVIGATION SYSTEM + ON BOARD COMPUTER and DIS + SPORTS MULTIFUNCTIONAL LEATHER STEERING WHEEL with PADDLESHIFT + E/STEERING COLUMN with EASY EXIT-ENTRY MEMORY + HEATED- CHROMATIC and POWER FOLDING E/DOOR MIRRORS + "MUST BE SEEN & DRIVEN !!" 2 KEYS + MOT NOV 19 + BOOK PACK.